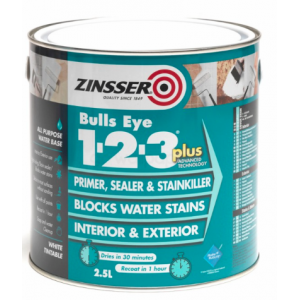 Bulls Eye® 1-2-3 is our classic universal interior and exterior, water-based, primer-sealer. It offers low odour application, quick drying convenience and excellent adhesion to glossy surfaces. Thinning: Add 10% clean water and stir thoroughly. Note that thinning the primer may affect its stain blocking properties. 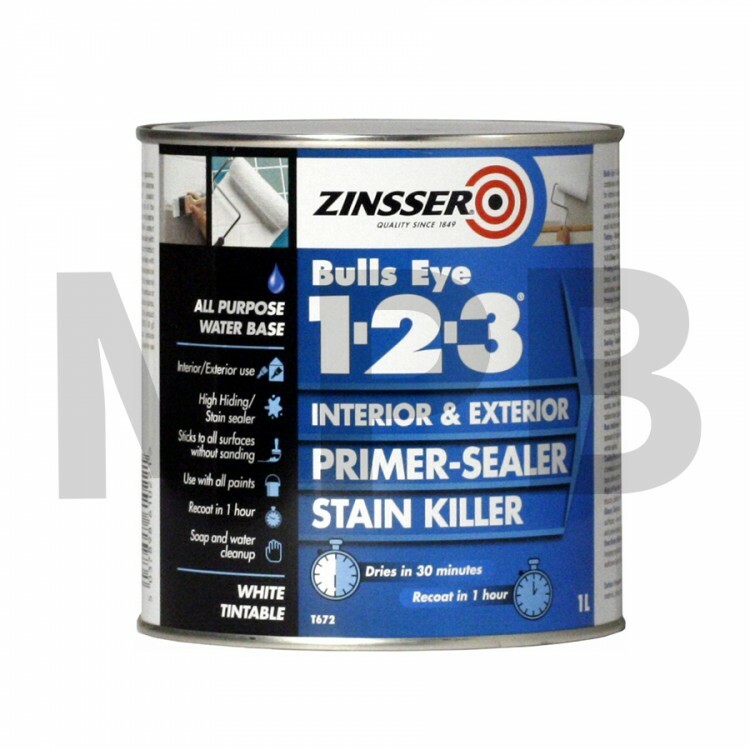 Bulls Eye® 1-2-3 effectively primes and seals a wide variety of interior and exterior surfaces. A ‘bond coat’ primer that’s great for hard-to-stick surfaces, it offers excellent adhesion without sanding. Bulls Eye® 1-2-3 also prevents rust formation when applied over clean ferrous metal such as iron and steel. Bulls Eye® 1-2-3 contains a biocide that protects the dried coating against fungal degradation, making it ideal for high-humidity areas such as bathrooms and laundry rooms. It offers effective resistance to fungal degradation on the underside and surface of the primer film, prolonging the life of your paint job. Bulls Eye® 1-2-3 is great for blocking stains. It permanently and completely seals graffiti, grease spots, tar and asphalt – inside and out. Bulls Eye® 1-2-3 is rust inhibitive and ideal for new metal. It resists flash rusting in its “wet” state – and provides rust resistance for the life of the coating. It dries to a smooth, tight, water-resistant film that is perfect for painting iron railings, steel doors, metal panels, duct work, galvanised gutters – any interior or exterior metal surface. It has a quick 30 minute drying time and 1 hour dry time. The white finish can be tinted towards the colour of your topcoat (mid-tone colours only) to eliminate the need for one coat of paint – saving both time and money and where a dark topcoat is required, the grey or deep tint base can be used for improved hide and coverage. 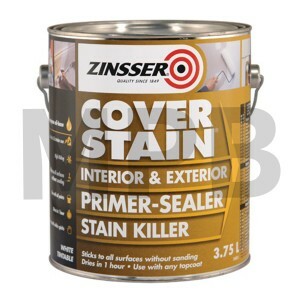 Zinsser Cover Stain White Cover Stain® is the only interior / exterior primer, sealer, stain s..
Zinsser Bulls Eye 1-2-3 PLUS White Bulls Eye® 1-2-3 Plus is a next generation universal water-..